Over 175 satisfied customers have bought this davit system from us. Another revolutionary davit system that's sweeping the marine industry. 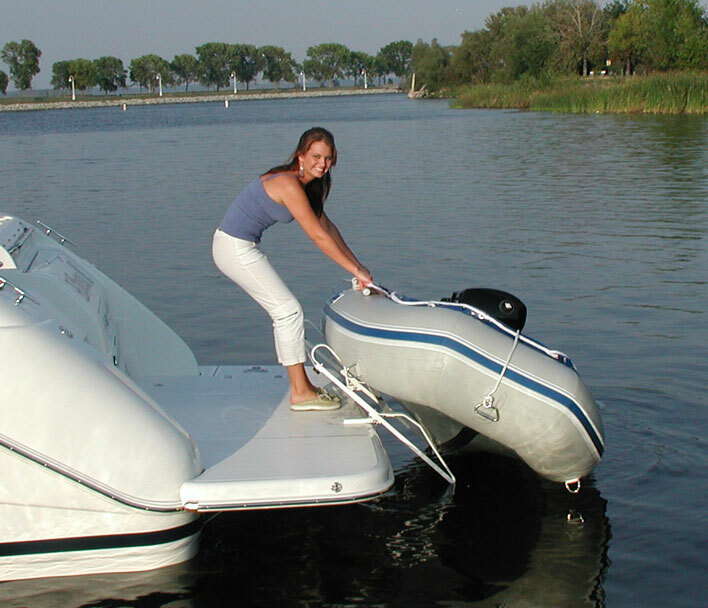 Easily mounted on the swim platform, this hassle free system lets you lift and pull your dinghy on for easy storage or just push off for launching. And will always be available for an emergency. Removable options also available. This davit system is white powder coated and constructed with light weight aluminum, stainless steel fasteners and hardware allowing for a highly durable corrosion free system that only weighs 15 pounds. The skid-plates are made of polyethylene and will allow for easy scuff-free maneuvering. 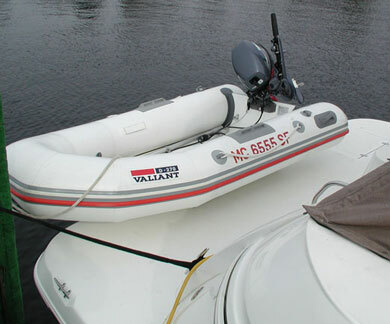 This hassle free system lets you lift and pull your dinghy on for easy storage or just push off for launching. Easily mounted on the swim platform. No major installations, no expensive and complex gluing, no hassles, no damage to dinghy, less expensive and will last forever! Other davit systems require gluing of parts, this system does not. Don't compromise with bulky components you have to glue to your dinghy, forever ruining it's appearance! You can also remove the long bars if you order the 36" extensions system. They can be customized with hard foam inserts to perfectly match the hull shape of your rib. The system size is 37" wide (port to starboard measurement - the way the dinghy lays) by 40" long (fore to aft). View sizing mounts here. They should not exceed the 500 pound safe load limit. Customized davits can be purchased for larger loads. Flexible mounting systems available. View them here.